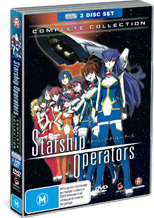 This impressive anime boxed set revolves around a group of starship trainees, more specifically the 73rd class of cadets of the Defense University of a small planet called Kibi and upon returning to their home world after a training mission, they learn that their world has been taken over by a hostile government. From here, the trainees decide to take matters into their own hand, however in order for them to fund their attack on this nefarious government, they agree to take onboard a journalist who will record their activities. As they become involved in a variety of amazingly recreated anime battle scenes, they soon discover that not everything is black and white with their involvement which creates a plethora of other issues. Best described, Starship Operators is a political action anime series that features some great animation and what really pushes this series over the line is the professional voice acting that is not forced nor clichéd and suits the series perfectly. Even though the series is aimed at the older market, some children will also enjoy the storyline but what really makes its mark is the political intrigue as the viewer is taken on a futuristic journey of how actions and choices effect the fate of others.